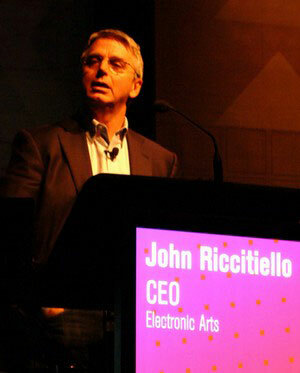 John Riccitiello is a member of the Academy of Interactive Arts and Sciences. He spoke at the D.I.C.E. Summit® in 2008. He works for Electronic Arts. A: I think it is a bit early to talk about my legacy. Some of my greatest beliefs regarding gaming are that our art form is today – or certainly has the potential – to be recognized as the peer of the best of Hollywood movies. I want to help others see that. I also believe that there is no inherent conflict between great creativity and achieving strong profitability – I believe they go hand in hand. More than trying to work on my legacy, I want to work to prove both of these points are true and see a day when these ideas are seen as common knowledge. A: This is a business and much of our success will be measured with a calculator – sales, revenue, profit and improving shareholder value. There is also a qualitative aspect of our industry. Making games we can be proud of. Pushing boundaries. As I mentioned above, I believe the quantitative and the qualitative measures go well together. Q: What's your favorite part of game publishing? A: I like that moment when a player says, "Wow, that was really cool!" It's fun watching a new concept evolve from a pitch meeting, to internal review, to critics, and finally to the players. I like watching when something completely new unfolds in front of the player. Above all, I like it when a production team gets it – when they realize they have something great and will do anything in their power to see that greatness make it to the consumer. Q: If you weren't in game publishing, what would you be doing today? A: I've marketed soap, soda pop, ice cream, and sports equipment. I went into private equity for a few years and learned a lot about the media industry- print, TV and film. But the truth is, I really love the game business – the creativity, the people and the games. If I wasn't the CEO of EA, I might be working with a team to make one great game. A: Pre-production – I'd have teams work to get to far greater design clarity before they begin full-scale production. Lack of clarity up front is probably the #1 reason why games are late, over budget or, in some cases, not that good. A: Helping make The Sims 3 a huge success. A: That's the kind of question people used to ask me in the 90's. I think everyone today believes games are important. There are still hold outs that think of games as a lesser art form to movies or novels – we're going to prove them wrong on this front in the coming 3 to 5 years. A: I think everyone in the industry should be playing games as readily as they watch TV or go to the movies. If you don't play games, you should be in another industry. Can you imagine a Hollywood exec not watching movies or a book publisher that doesn't read? A: The industry has gotten more complicated, but the challenge is still pretty much the same: Give consumers a great experience for their money; surprise them; make them say, "Wow, that was cool!" A: Keeping creativity alive – making creativity the center of your company's culture – while managing the day to day of a real business in a challenging economy.